What intellectual capacities—or if one prefers, cognitive virtues—should the citizens of a modern democratic society possess? For decades, one dominant answer has been the knowledge and reasoning abilities associated with science literacy. Scientific evidence is indispensable for effective policymaking. And for a self-governing society to reap the benefits of policy-relevant science, its citizens must be able to recognize the best available evidence and its implications for collective action. This account definitely isn’t wrong. But the emerging science of science communication, which uses scientific methods to understand how people come to know what’s known by science, suggests that it is incomplete. Indeed, it’s dangerously incomplete. Unless accompanied by another science-reasoning trait, the capacities associated with science literacy can actually impede public recognition of the best available evidence and deepen pernicious forms of cultural polarization. The supplemental trait needed to make science literacy supportive rather than corrosive of enlightened self-government is science curiosity. Simply put, as ordinary members of the public acquire more scientific knowledge and become more adept at scientific reasoning, they don’t converge on the best evidence relating to controversial policy-relevant facts. Instead they become even more culturally polarized. This is one of the most robust findings associated with the science of science communication. It is a relationship observed, for example, in public perceptions of myriad societal risk sources—not just climate change but also nuclear power, gun control and fracking, among others. In addition, this same pattern—the greater the proficiency, the more acute the polarization—characterizes multiple forms of reasoning essential to science comprehension: polarization increases in tandem not only with science literacy but also with numeracy (an ability to reason well with quantitative information) and with actively open-minded thinking—a tendency to revise one’s beliefs in light of new evidence. There’s no doubt that scientific reasoning demands a high degree of proficiency in System 2 information processing. But as ordinary members of the public become more adept at this style of reasoning, they don’t think more like scientists. Instead, they become more reliable indicators of what people who share their group commitments think about culturally contested risks and related facts. This relationship is readily apparent in public opinion survey studies (Figure 1). It has also been documented experimentally. Experiments catch these thinking capacities “in the act”: proficient reasoners are revealed to be using their analytical skills to ferret out evidence that supports their group’s position, while rationalizing dismissal of such evidence when it undermines their side’s beliefs. What explains this effect? As counterintuitive as it sounds, it is perfectly rational to use one’s reason this way in a science communication environment polluted by tribalism. What an ordinary member of the public thinks about climate change, for example, has no impact on the climate. Nor does anything that she does as a consumer or a voter; her individual impact is too small to make a difference. Accordingly, when she is acting in one of these capacities, any mistake she makes about the best available scientific evidence will have zero impact on her or anyone she cares about. One doesn’t have to be a Nobel prizewinner to figure out which position one’s tribe espouses. But if someone does enjoy special proficiency in comprehending and interpreting empirical evidence, it is perfectly predictable that she’ll use that skill to forge even stronger links between what she believes and who she is, culturally speaking. Conceptually, curiosity has properties directly opposed to those of identity-protective cognition. Whereas the latter evinces a hardened resistance to exploring evidence that could challenge one’s existing views, the former consists of a hunger for the unexpected, driven by the anticipated pleasure of surprise. In that state, the defensive sentries of existing opinion have necessarily been made to stand down. 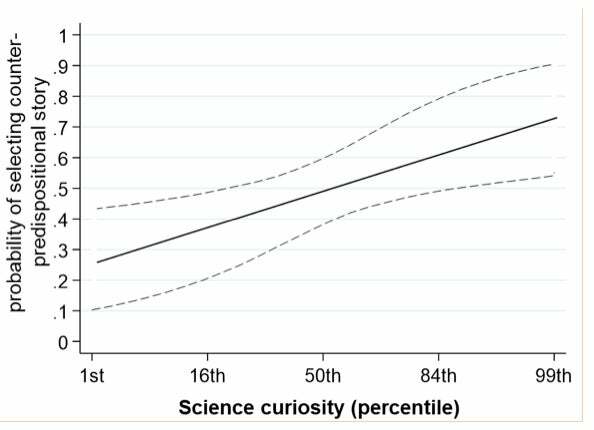 One could reasonably expect, then, that those disposed toward science curiosity would be more open-minded and as a result less polarized along cultural lines. This is exactly what we see when we test this conjecture empirically. In general population surveys, diverse citizens who score high on the Science Curiosity Scale (SCS) are less divided than are their low-scoring peers. 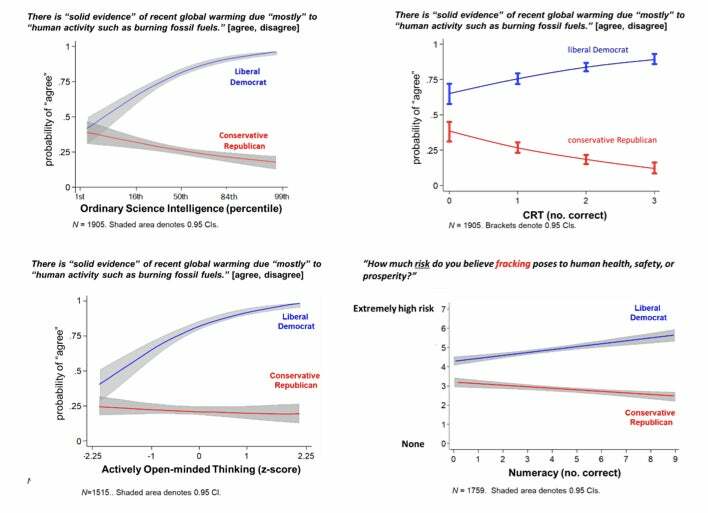 Indeed, rather than becoming more polarized as their science literacy increases, those who score highest on SCS tend to converge on what the evidence signifies about climate change, private gun ownership, nuclear power and the other risk sources. Experimental data suggest why. Afforded a choice, low-curiosity individuals opt for familiar evidence consistent with what they already believe; high-curiosity citizens, in contrast, prefer to explore novel findings, even if that information implies that their group’s position is wrong (Figure 2). Consuming a richer diet of information, high-curiosity citizens predictably form less one-sided and hence less polarized views. This empirical research paints a more complex picture of the cognitively virtuous democratic citizen. To be sure, she knows a good deal about scientific discoveries and methods. But of equal importance, she experiences wonder and awe—the emotional signatures of curiosity—at the insights that science affords into the hidden processes of nature. The findings on science curiosity also have implications for the practice of science communication. Merely imparting information is unlikely to be effective—and could even backfire—in a society that has failed to inculcate curiosity in its citizens and that doesn’t engage curiosity when communicating policy-relevant science. What, then, should educators, science journalists, and other science communication professionals do to enlist the benefits of science curiosity? The near-term answer to this question is straightforward: join forces with empirical researchers to study science curiosity and the advancement of their craft. The value of such collaborations was a major theme of the National Academy of Sciences’ recent expert-consensus report Communicating Science Effectively. Indeed, connected lab-field initiatives of the kind envisioned by the NAS Report are already in place. The Science Curiosity Scale is itself the product of a collaborative project between social science researchers affiliated with the Cultural Cognition Project at Yale Law School (CCP) and the Annenberg Public Policy Center at the University of Pennsylvania (APPC), on the one hand, and science film producers at Tangled Bank Studios, on the other. Results from that initiative, in turn, inform a collaboration between APPC social scientists and science communicators at the public television station KQED. Funded by the National Science Foundation and the Templeton Foundation, that partnership is performing field studies aimed at making science films and related forms of communication engaging to science-curious members of culturally diverse groups—including the groups that are bitterly divided on climate change and other issues. For now, there are no proven protocols for using science curiosity to help extinguish the group rivalries that generate public disagreement over policy-relevant science, particularly among the most science literate members of such groups. But if the science of science communication is not yet in a position to tell science communicators exactly what to do to harness the unifying effects of curiosity, it unmistakably does tell them how to figure that out: by use of the empirical methods of science itself. Dan M. Kahan is the Elizabeth K. Dollard Professor of Law and Professor of Psychology at Yale Law School. His research specialty is science communication, and he is a member of the Cultural Cognition Project and Annenberg Public Policy Center research team that, in collaboration with Tangled Bank Studios and KQED, is examining science curiosity. Should We Subsidize Nuclear Power to Fight Climate Change?